Located in the Haut-Rhin, Colmar is a charming town. Near this town, Obernai where our magnificent 3 star hotel is nestled: Les Jardins d'Adalric. Take advantage of the privileged location of our hotel near Colmar to visit Alsace and its surroundings. The Hotel Les Jardins d'Adalric is the ideal starting point to discover the cultural and historical treasures of the region. Discover the Wine Route, the city of Strasbourg, Obernai by staying in our hotel located a few cables from the city of Colmar. You can visit the Wurth Museum of Modern and Contemporary Art, the Unterlinden Museum of Fine Arts or the Lalique Museum. Do not miss to discover the local gastronomy, to taste the wines of Alsace and to stroll in the local markets. Discover Colmar and its exceptional places: the magnificent Pfister house, the impressive Saint-Martin collegiate church, the “Têtes” house and its astonishing architecture or the charming little Venice district. The Hotel Les Jardins d'Adalric also offers various activities to enhance your stay in our hotel near Colmar. For the travellers in search of well-being, you will find at only 500 mothers of the Hotel an aquatic complex with saunas, hammams and jacuzzis. So take advantage of this wellness area to relax. Finally, for travellers looking for thrills, discover the Europa Park, Alsace Aventure, Ecomusée d'Alsace, Parc du Petit Prince or Cigoland amusement parks. 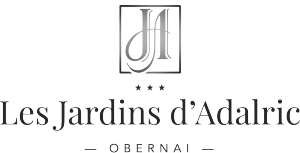 Located in the rue du Maréchal Koenig in Obernai, the hotel Les Jardins d'Adalric is an exceptional place, where charm and comfort are ideally combined. Excellence begins as soon as you cross the entrance thanks to a smiling staff and small care. Our hotel near Colmar has 44 rooms and 2 suites decorated with the greatest care and great taste. Equipped with a contemporary and refined decoration, they are conducive to relaxation and rest. In order to satisfy the expectations of all guests, the rooms are divided into 4 categories: Classic, Comfort, Superior and Duplex Suite. Each of them has the necessary equipment for a comfortable stay. In order for each guest to start the day as nicely as possible, Adalric Gardens invites you to enjoy a hearty breakfast by the beautiful pool. The exterior of the hotel is as charming as the interior, so the pleasures of the palace are associated with the pleasures of the view. The swimming pool and its surroundings are conducive to a moment of idleness, enjoy a little calm in a beautiful setting. For guests in vehicles, our hotel near Colmar has a secure car park. This way, your vehicle is safe throughout your stay.